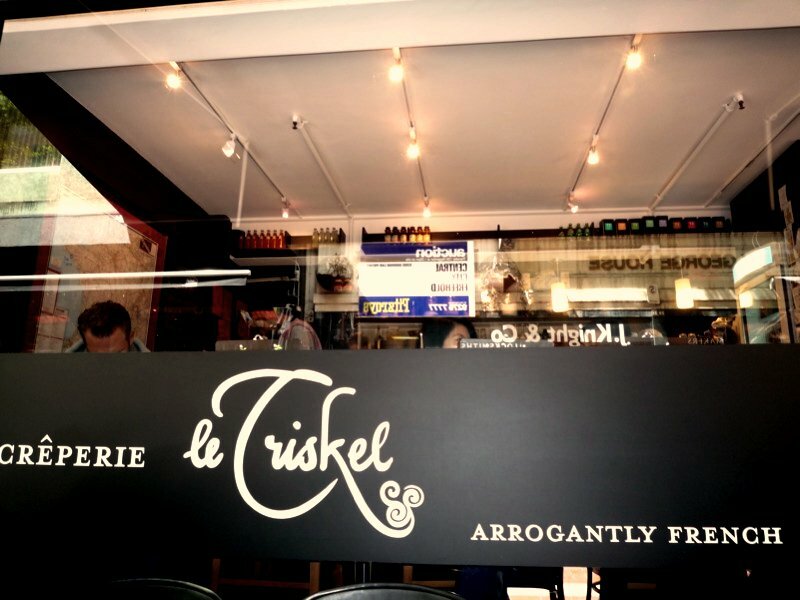 1) The sign on the front window says "Crêperie Le Triskel: Arrogantly French". 2) Despite promises of arrogance on the front window, the proprietor Michael is completely delightful and charmant and not at all arrogant. He also speaks to me in French and did me the honour of pretending to mistake me for a Frenchwoman the first time we spoke ("Vous n'êtes pas française? Mais vous parlez très bien le français!" "Ah, vous dites ça a toutes les filles!!" etc). 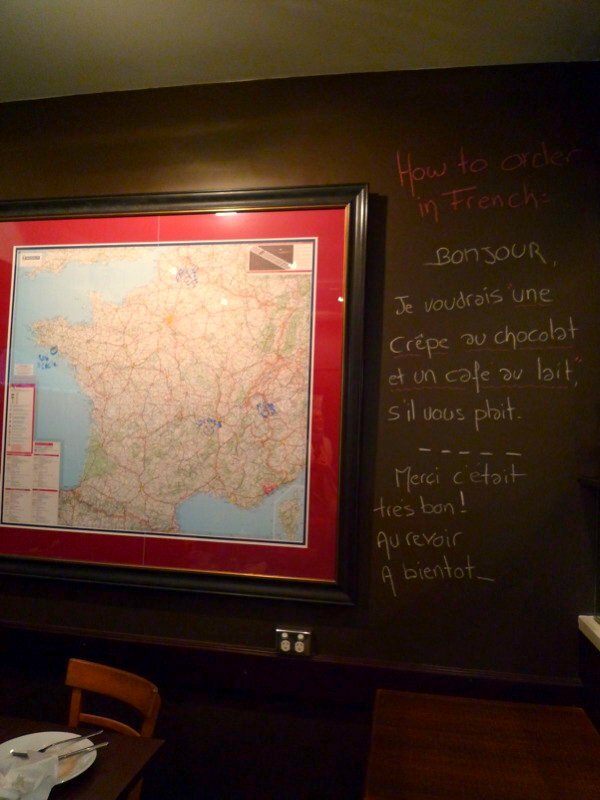 3) They have a huge map of France hanging on the wall, next to chalked up bilingual phrases so that non-francophone customers can also order in French if they wish to. 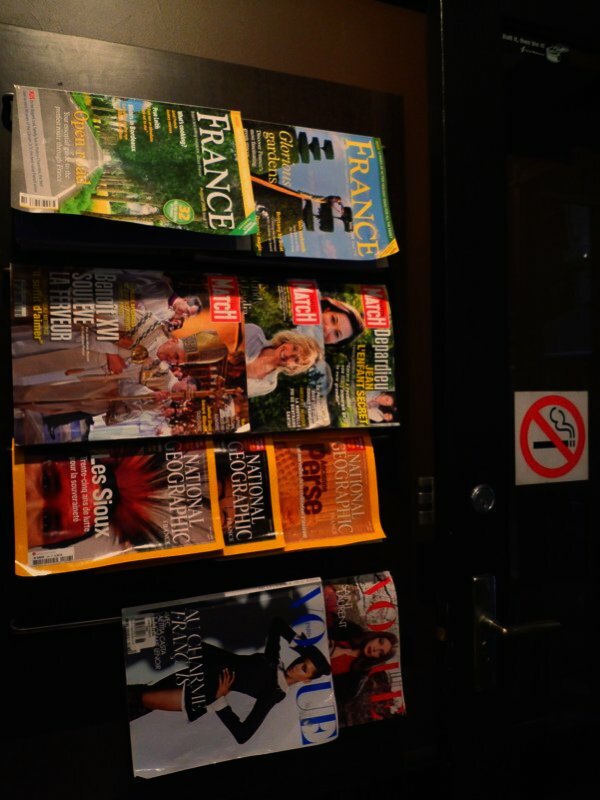 4) The magazines on offer are France Magazine (in English), and Vogue, National Geographic and Paris-Match (all in French). 5) They play old French pop songs by Jacques Dutronc and Françoise Hardy, but the Frenchness of the place never gets cheesy. 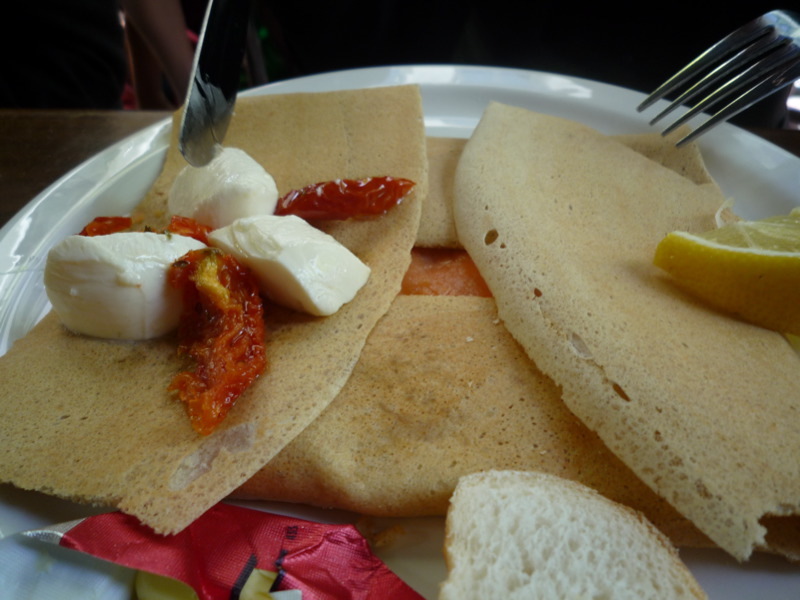 6) The savoury galettes are delicious - very authentic and thin, made with buckwheat flour and served with a side salad and a few slices of baguette. 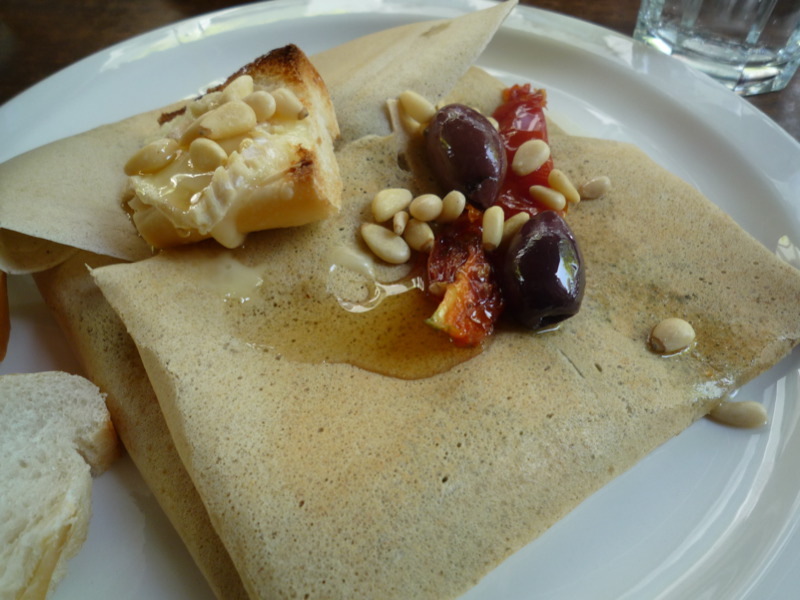 The galette above is La Biquette ($13) with fresh goats cheese and spinach, topped with a slice of grilled Caprifeuille goats cheese, olives, SSD tomato, honey and pine nuts. Below is L'Estivale ($13) with ricotta, chives and smoked salmon, topped with Bocconcini and SSD tomatoes. 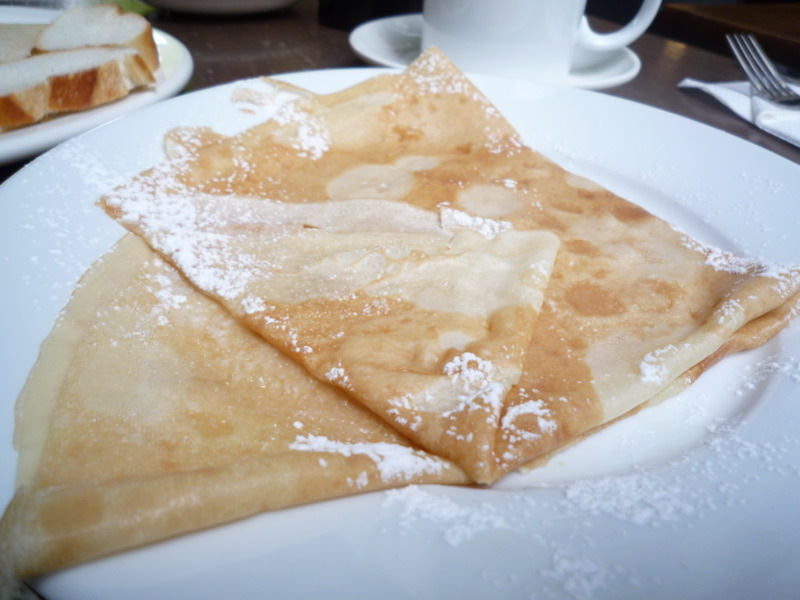 7) The sweet crêpes are equally delicious. The one on the left is with nutella, the one on the right was with lemon and sugar ($4 each). 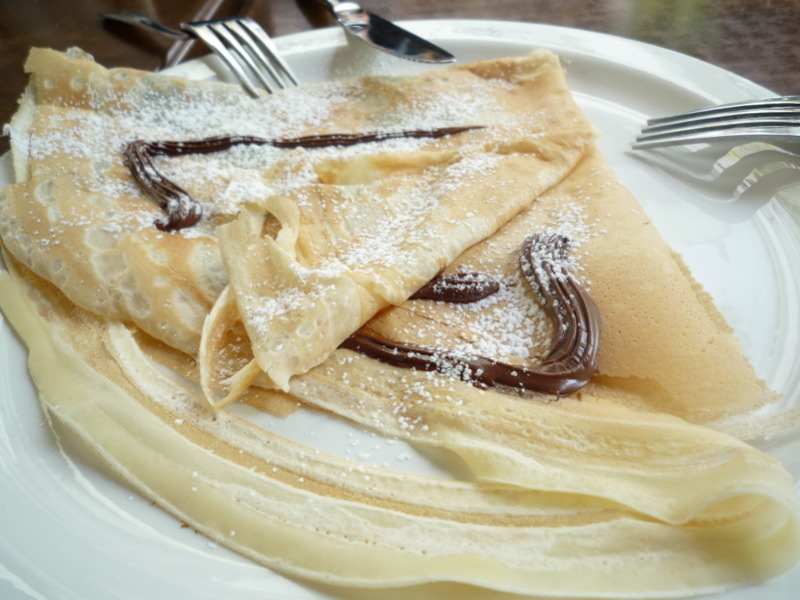 8) They have a great breakfast menu, including galettes and crêpes, tartines with jam, marmalade, honey or nutella, croissants, pains au chocolat and grands bols of café au lait. 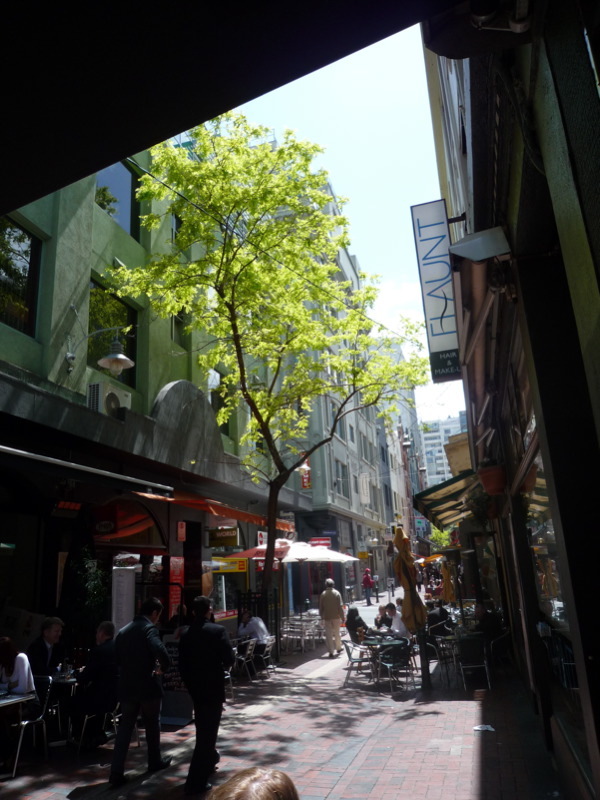 9) On a sunny morning you can sit outside at one of the tables under the large awning and - if you tilt your head to one side, squint and really really use your imagination - you can almost pretend that Hardware Lane is a cobbled street in Paris. I too love the La Biquette, and I'm just so impressed he imports his own caprifeuille. I just have one thing to say. Ask Michael to shake the Organina for you. Mon dieu! 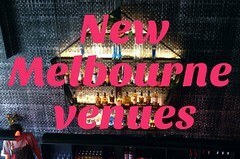 Did you know that Le Triskel have just started cheese and wine degustation nights every Friday from 6pm? Fabulous French cheeses and wine to complement.....highly recommend you try! Ah, merci for that information, anonymous commenter! 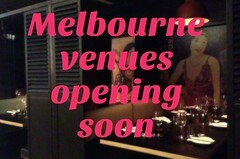 I shall adjust the opening hours at the top of the post accordingly. Hi there, great post. I actually went looking for a blog post about Le Triskel because I know it doesn't have a website, and liked the way yours was written the best. I hope it's okay that I've linked to it on my own blog - http://theedibleedinburgh.blogspot.com (it's based on Edinburgh food though), so please let me know if you'd rather I didn't and I'll remove the link.